The word chelation comes from the Greek word “chele", which means claw. 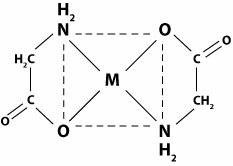 Chelation is the sequestering of a metal ion within the ring structure of an organic compound, similar to the way in which the claw of a crab closes around an object in its grasp. This process makes the metal inert and prevents it from interacting with other molecules. When chelating agents are used for lead or mercury poisoning, for example, these heavy metal toxins are tightly bound to the chelating agent and excreted from the body in the urine and stool. Chelation therapy has been used to treat lead poisoning since the 1940's. Various natural and synthetic chelating agents are now commonly used to improve coronary artery disease and treat heavy metal poisoning. The heavy metal toxins with the greatest impact on our health include lead, mercury, arsenic, cadmium, aluminum, antimony, and uranium. The benefits of reducing a person's total body burden of toxic metals are significant. These likely include a reduced risk of heart disease, cancer, kidney failure, autoimmune disease, dementia, cataracts, and arthritis. Many chelating agents have antioxidant properties and support mitochondrial function, resulting in a higher level of energy, memory, and focus. The anti-aging impact of some chelating agents is thought to be related to their ability to reduce free radical damage and improve mitochondrial function.